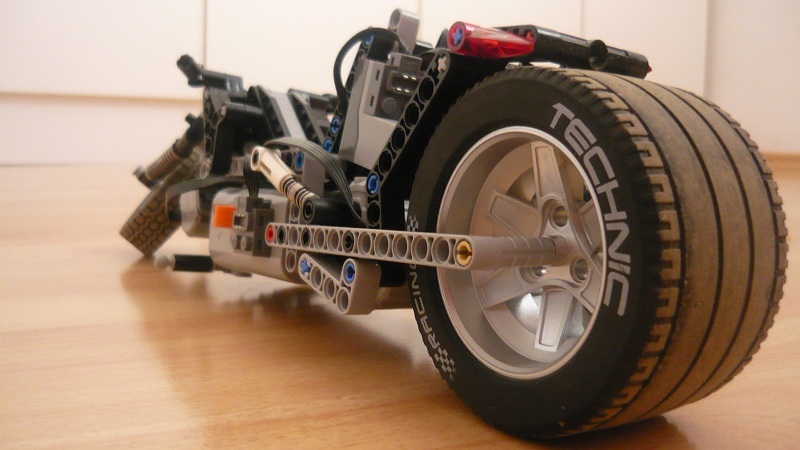 This week Jernej Krmelj (Zblj) presented his LEGO Technic Chopper. It would have been just one more LEGO bike, if he didn't have stretched the limits incorporating a couple of PF motors to make it remotely driven. With very low center of gravity because of using the PF battery box in the lowest position possible, an huge and wide back tire, and and smart steerer design, this chopper seems possible to drive like a charm! The video itself, is also very well done, in the way it shows the model driving capabilities. The initial scene where the Bionicle rider jumps to his seat in the Chopper, is an absolute must! Both front and rear wheel suspension. Self-balancing. However it doesn't need to. IMO the less pleasant detail in this model, is the large gears used to drive the back wheel. However according to Jernej, he tried to use one chain but it kept slipping and breaking. Then maybe some more but smaller gears, may have produced a nicer visual effect. It is the huge and wide tire in the backside, combined with the ultra low center of gravity, those who allow for this model smooth driving and steerable capabilities. This without the need of complex self-balancing computing solutions, like those seen in other bikes controlled with NXT (although, all them are even larger remarkable achievements on their own). In all fairness, the motor and the programming to keep the thing moving stably are absolutely marvellous. These are both very cool creations. The style of the chopper is really nice and I love the animation of the guy getting on it. As for the NXT version, it would only be a small matter of attaching a remorely controlled weight that moves slightly from side to side (and maybe an increase in speed would be useful) enableing direct control of it's direction of travle, much like how the rider of a segway only has to shift their weight to control it.